It is fun. We play games. Mr. Ahlness is fun. We do art. We change desks. Dr. Coram is sick. We want her back. I hope she gets well fast. One of my resolutions is trying more food. I have 2 dogs. Their names are Jada and Harley. Jada is a Jack Russell and Harley is a bulldog. Harley and Jada like to play with each other. Jada and Harley like to play with me too. I went to the beach and built a fort. I built a fort with a friend. We made it out of logs. We made a seat too. I hate the Wasl. I like the snacks. The Wasl is a big test. Wasl stands for Washington assessment of student learning. I am going to plant plants for Earth Day. They are all real stories. I am thinking about the baseball game. I went to the stadium and saw them. It was fun. The Mariners won. 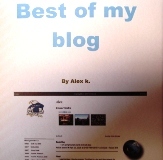 My blog’s name Alex. It is named Alex because my name is Alex. My blog looks really cool. It has two pictures.